As game developers continue lining up to take shots at Windows 8, it falls on Microsoft to go on the defensive and address their concerns. Part of that process comes from the recent rebranding of Windows 8 games. Games will now fall under the banner of "Xbox Windows," invoking the firm's popular gaming console. The first titles revealed for Xbox Windows are the built-in games Minesweeper, Solitaire Collection, and Microsoft Mahjong. They will also integrate with Microsoft's Xbox Live service, offering Gamerscore points for earning achievements in the games. "With Xbox on Windows 8, we created easy entry points into the types of entertainment that you'll enjoy, including games," a Microsoft spokesperson said in a published report. "The Games app prominently features your avatar, profile, friends and Gamerscore and allows you to explore your friends' avatars." For developers who were already concerned about making games for Windows 8, Microsoft's comments are anything but reassuring. One of the largest fears from developers is that Windows 8 will become a closed platform for games, requiring extensive certification processes and mandatory features to release through the Windows Store. 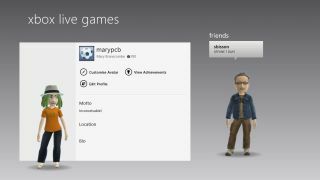 The Xbox 360 is already a closed platform, so bringing that branding to the PC sets off immediate red flags; as does Xbox Live integration and Gamerscore support. Microsoft is yet to comment on whether these features will be required across all Xbox Windows games, which is the case on Xbox 360. Windows 8 Pro gamers will have other options aside from the Windows Store, with the desktop view offering the same game distribution methods possible on Windows 7. The potential problem will be for Windows RT users, who will not have the desktop view option and must rely on the Windows Store for new software. It's possible they may be alienated if developers pass on releasing games through a developer-unfriendly Windows Store.